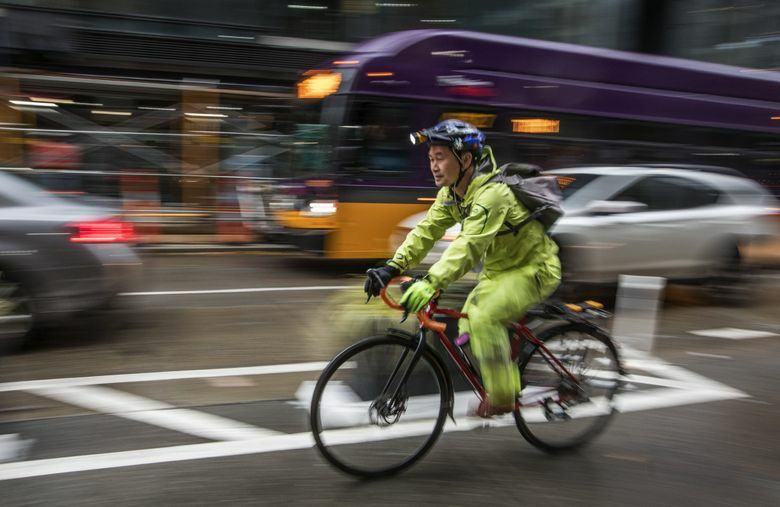 Seattle’s chief traffic engineer is less concerned with how fast cars are getting through the city and more concerned with how people — on foot, on bike, in buses and cars — interact with the streets. Dongho Chang’s Twitter feed is boring. You want caustic political opinions or an endless cavalcade of bad news? Look elsewhere. Pictures of plastic speed bumps outside a West Seattle elementary school. New crosswalks in Lake City. New curb ramps in South Park. Protected bike lanes all over the place. Chang’s feed is a catalog of changes to Seattle’s street grid and urban landscape. Almost all those changes are small, but when taken together, they paint a picture of a city in transformation, one less focused on fast car travel and more focused on making streets safe and reliable for walkers, bikers, bus riders and drivers. Seattle isn’t building many new streets these days. Chang, along with dozens of engineers and technicians, works to make the streets we have function better, rejiggering speed limits and lane lines, trying new ideas to make the streets more welcoming and more efficient. The results, like them or not, are apparent: Seattle’s not getting easier for drivers anytime soon. But it’s one of the safest cities in the country for pedestrians. And while downtown neighborhoods have added 45,000 jobs in the last six years, the rate of drive-alone commuters has declined, and transit use has spiked. Chang inspects and documents all these changes by bike, his rain-or-shine transportation of choice. In September, for instance, Chang posted a rainy picture of a bus and some pedestrians at the corner of Pike Street and 6th Avenue. “Bus queue jump on pike with early walk,” he wrote on Twitter. Not only does the bus get to clear the intersection before cars traveling in the same direction, but pedestrians get to start crossing early. “The pedestrian can get into the intersection and into the crosswalk and across before a driver is able to make the turn,” Chang said. Guided by collision data to find dangerous intersections, the Seattle Department of Transportation has changed the signal timing on dozens of traffic lights throughout the city to give pedestrians a jump start. Another cellphone snapshot from Chang’s Twitter feed: a curb bulb at the Beacon Hill Link station — pavement painted burgundy, extending from the sidewalk to enlarge pedestrian turf while narrowing the space for cars to turn. 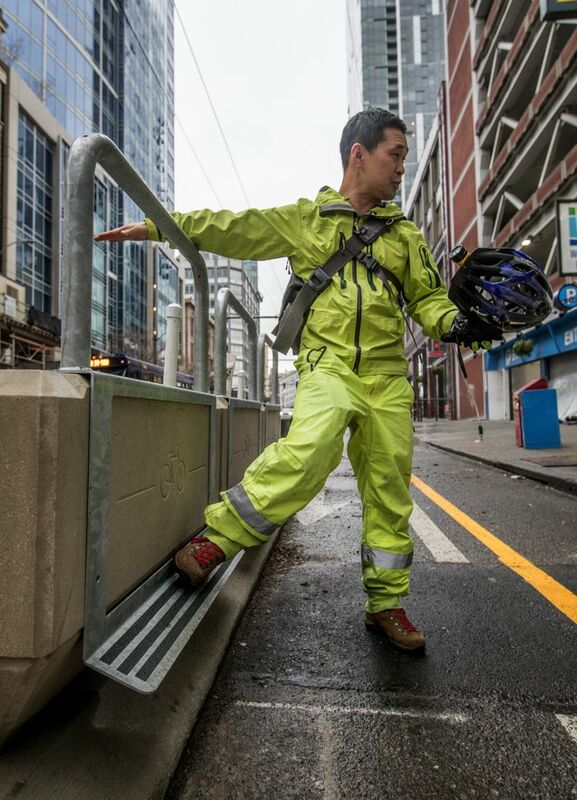 Chang takes these pictures on daily bike rides around the city — either commuting between downtown and his Magnolia home, or setting out specifically to see SDOT projects and the city from street level. Born in Korea, Chang, 49, moved to Olympia at age 9 and went to high school in Spanaway. He studied civil engineering at the University of Washington before getting a master’s in public administration at the UW. After 15 years at the Washington State Department of Transportation, where he was on the team that developed the state’s first live traffic map back in the early 1990s, Chang became the city of Everett’s traffic engineer in 2006. He’s been Seattle’s traffic engineer for nearly six years. From the outset of his career, Chang said, engineering was less about what he was building than how it would be used. Go along with Chang on one of his ride-abouts and you’ll see not just streets, sidewalks and bike lanes, but the components that make up each of them. For much of its length, the new Belltown extension to the Second Avenue bike lane is separated from car traffic by a marked, raised curb buffer. As it approaches major intersections, the curb buffer is supplemented by several plastic planter boxes that act as dividers. The plastic planter boxes then segue into more substantial concrete planter boxes, with raised metal bars for cyclists to lean on when stopped. It’s a cascade of signals to the rider that, at the intersection, separation from car traffic disappears. Of course, each bike lane, each curb bulb to slow traffic, usually takes something away, be it a traveled lane, parking or just a little extra roadway breathing room. This is the direction Seattle’s voters have chosen. The last three elected mayors have pushed to make streets better for transit, bicyclists and pedestrians, not necessarily drivers. No City Council member in at least 15 years has campaigned on a platform of bringing relief to drivers. Virtually every major candidate for Seattle mayor this year ran on a similar pro-transit, pro-pedestrian transportation platform. The orders, in other words, come from the top, and it’s Chang and his colleagues’ job to carry out the vision. Chris Pangilinan, a former traffic engineer for transit agencies in New York and San Francisco, led, with Chang, a session on traffic-signal priority at a conference of transportation officials in Chicago last month. Chang dressed for business when he led the session, Pangilinan said, but the rest of the conference could be found in his bad-weather biking attire — head-to-toe chartreuse rain gear — the better to get out and explore the minutiae of Chicago’s streetscape. When he got back to Seattle, Chang briefed his colleagues on esoterica like the tactile feel, underfoot, of the pavement between walking and biking zones, and what sort of material is best for curb-ramp warning plates. The first time Pangilinan, now a program director for the national advocacy group Transit Center, became aware of Chang was from a story four years ago, a sort of legend among urban-transportation planners. In April 2013, under the cover of darkness, some modest bike-safety vigilantes took it upon themselves to create Seattle’s first bicycle-lane buffer. They used flexible plastic pylons to separate the painted bike lane on Cherry Street, underneath Interstate 5, from the adjacent traffic. Chang wrote a letter to the anonymous bike activists, not chastising them or threatening them for illegally altering city property, but apologizing because he had to take down the pylons — they were too tall for state regulations. “You are absolutely correct that there are low cost and simple ways to slow traffic, increase the sense of protection and provide bicycle facilities that are more pleasant and accommodating,” Chang wrote. The activists’ “strong message” was “being heard loud and clear,” he added. Three months later the city installed permanent pylons to protect the bike lane on Cherry Street.